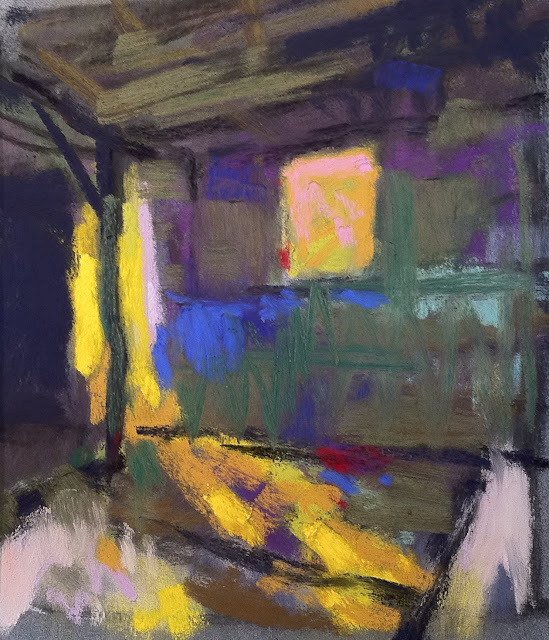 The yellow window is a perfect example of the light value square exercise. Unity through value with detail through hue. Not knowing what your doing is the best way to go about it. All this rules stuff is most helpful when your(sic) stuck or you've surprised yourself and want to know why. I'm with Lou--and this isn't a sketch, this is a painting. I suspect a lot of the rules in art came about from years of doing and were never really rules at all, just stuff passed down by folks who like to analyze. Color moves us to respond with color--yellow sparks violet responses; put down red and a need for green pops to mind...Human nature set free and complimentary. Stay along enough and tertiary needs creep in. Stay too long, you've got mud. There's no mud in this Casey just vigorous strokes and great color. Thanks for this response, Linda. I almost see it as a poster, or a cartoon. I haven't had a chance to comment - been looking in on the cell phone. But I love this blog. I do not have to be a pastel artist to benefit from your insights. Thank you! I love the echos of color in this one (whether painting or drawing). Not only is there excitement and interest, but stability as well. It's great that you read, here, Dan! Thank you very much. This is a really cool sketch. I thought it was oil when I saw it. Thanks, Jala! I see it as sort of like a poster.